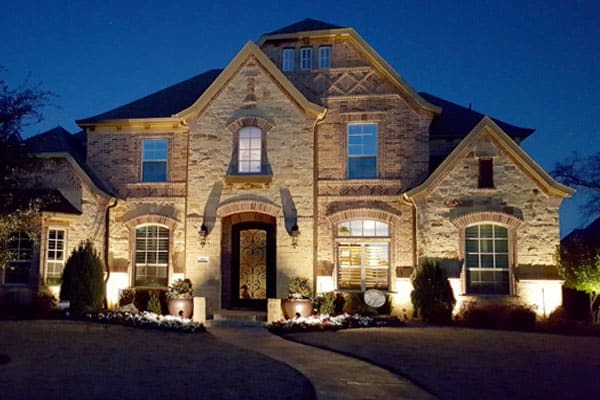 Residential and commercial customers in Azle can count on Creative Nightscapes for outdoor lighting to enhance their property. 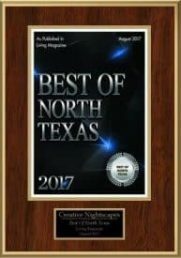 Company owner Patrick Cheatham founded Creative Nightscapes in 2004 and has built a team of more than a dozen employees who are dedicated to providing customers with exceptional service. Over the years, our company has successfully done more than 4,300 projects for homeowners and business owners in the greater DFW area. We handle all aspects of the design and installation processes ourselves, so you don’t have to worry about any work being outsourced to subcontractors. Some of our past customers have left online reviews to let others know how happy they were with our services. These reviews often mention the high quality of the work that was done and how professional and courteous our employees were throughout the project. Creative Nightscapes is also a proud member of the Association of Outdoor Lighting Professionals and the Better Business Bureau. Ornamental trees, carefully designed flowerbeds, pathways, and other parts of your landscaping don’t get the attention they deserve when your yard is dark. Landscape lighting can highlight these features, making them stand out at night. Creative Nightscapes provides landscape lighting services in Azle for residential and commercial customers. Having lights on in your yard can run up your energy bill throughout the year. LED lighting provides a way to keep your property well-lit while also lowering your energy usage. At Creative Nightscapes, our team can help you choose the best LED lights for your residential or commercial property. When it’s dark out, having a yard or property that isn’t lit up can put your home or business at a higher risk of intruders. Creative Nightscapes offers security lighting to help you keep intruders away while also providing illumination for family or visitors for walking without tripping or falling. Get more use out of your patio on warm nights with the right patio lighting. Our team at Creative Nightscapes can help you select a design that enhances your home and then install your new patio lights. We offer patio lighting design and installation services for customers in the Azle area. With poolside lighting at your home, you don’t have to limit swimming to the daylight hours. Creative Nightscapes offers poolside lighting that can make it safer to use your pool at night. Our experts provide design and installation services for residential and commercial customers who are interested in poolside lighting. When you put a lot of work into your garden, you should have a chance to show it off day and night. Our garden lighting services give you a way to illuminate your garden when it’s dark out. At Creative Nightscapes, we offer these services for homeowners and commercial property owners. For additional information on our outdoor lighting design and installation services in Azle, please contact Creative Nightscapes. Our outdoor lighting services are also offered in other cities in the northwest Fort Worth area. Great investment for our B&B! . There is now an added ambiance to the outside atmosphere in the evenings. It’s truly a peaceful beautiful look. It has changed the outside in the way of increased safety and the feeling of romance. We love to walk around in the evenings just looking at the trees. This company is were very professional in the installation and first visit to give a quote. I will use them again. I now want to add more lights to the windmill. Thanks, Jerry! Get job! Removed high voltage lighting. Installed Kichler LED lighting at home in Boling Ranch Estates. Placed up lights to accent the facade of home and dormer windows. Mounted down lights in trees to highlight steps and walkway to front entry, back walkways, flowerbed, and yard. Installed Kichler LED outdoor lighting at The Old Liberty School House. 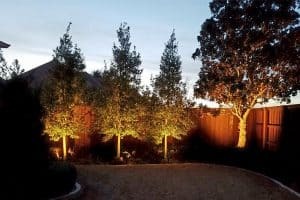 Mounted down lights in trees to create moonlight effect and illuminate driveway, parking area, stone wall, walkway, steps, and yard. Set well lights to accent arch over walkway.